Another Sankey diagram of Canada’s energy flows is featured in a blog post titled ‘Dividing the Big Picture: Visualizing Provincial Diversity’. The post appeared May 5, 2014 on the Canadian Energy Systems Analysis Research (CESAR) blog by David B. Layzell, Professor at the University of Calgary. It is a follow up to a previous CESAR blog post that showed “the big picture” for Canada (featured in a recent post here on the blog). Flows are in GJ per capita. This relative unit is different to the other national energy flow diagrams I have presented here on the blog. But it is interesting for differentiating energy consumption in the different provinces. 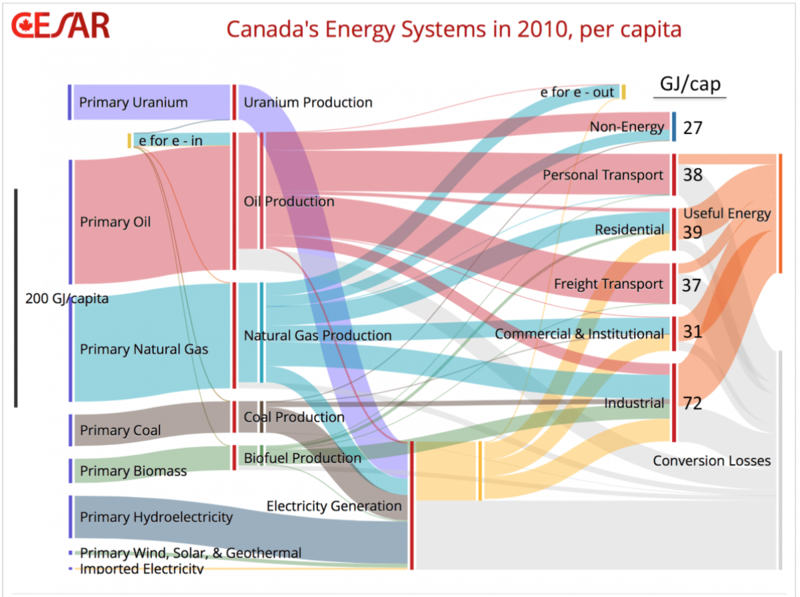 Check out all Sankey diagrams tagged ‘Canada’ here.